Fleeing Isis fighters have destroyed precious ancient ruins in northern Iraq as they retreat towards the city of Mosul in the face of the US-backed coalition effort to drive them from the country. Most of the militants were pushed out of the area around the 3,000 year old Mesopotamian city of Nimrud over the weekend, Iraqi army officials said, but troops remain wary of pockets of resistance, fighters hiding in tunnels and boobytraps – a favourite Isis tactic intended to cause further damage even after the battle has been lost. Monitors have not been allowed access to the main archaeological site yet as it is too dangerous, but local residents in the area 20 miles south of the Isis stronghold of Mosul said that fighters had destroyed almost all of it. “The ruins have vanished. History that went back thousands of years was finished off in one night. Fifty years of effort to protect these ruins went in vain,” local Hassan Mahmoud told BBC Radio 4’s Today programme. Isis used everything from explosive charges to sledge hammers and bulldozers to destroy Nimrud’s statues, temples and friezes in 2015 as part of their war on ‘idolatory’, but recent satellite imagery shows that activity in the area became more frenzied as Iraqi coalition forces drew closer. New images analysed by the American Schools of Oriental Research Cultural Heritage Initiatives (Asor Chi) from the site shows that the ancient, towering ziggurat, or pyramid-like temple complex, was levelled at some point between late August and early October. Many more artefacts have been looted for sale on the antiquities black market – a lucrative source of income for Isis’ caliphate across Iraq and Syria. It’s huge stepped tower – 200 ft in height – was considered “the most spectacular sacred structure known from ancient Mesopotamia” when it was uncovered in the 19th century, but appears to have been gradually destroyed in the last few weeks. 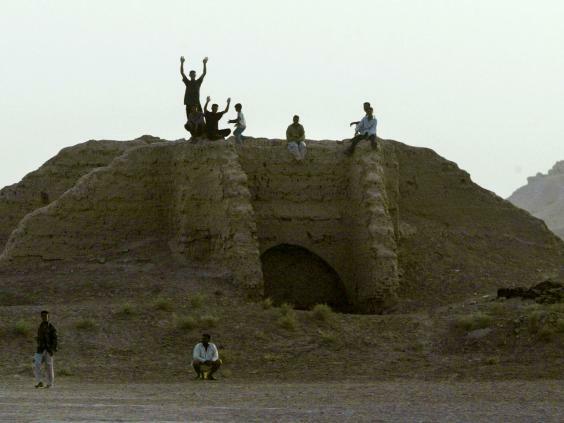 Michael Danti, Asor Chi’s academic director, said that the ziggurat ruins would have made a strategic defensive outpost since it was the highest point in the Nineveh plains for miles around – but Isis activity in the area has been unpredictable since the US-backed Iraqi coalition operation to retake Mosul got underway last month. ”We’re seeing a lot of really peculiar activity like this in Islamic State-held territory,“ Mr Danti said. The Iraqi army is now painstakingly trying to secure the area using unarmed drones to scout any imminent dangers. “We want to make sure we don’t inflict even the least damage to buildings in Nimrud already damaged by the evil [Isis],” a colonel in the 9th Armored Division told Reuters. Isis is still in control of the ancient city of Nineveh, in the centre of Mosul, and Khorsabad, another Assyrian site to the northeast, is close to the front line of the current conflict. The UN’s cultural agency UNESCO condemned the destruction at Nimrud as a war crime and an attack on the world’s shared heritage, pointing to ancient Mesopotamia’s role as a cradle of civilisation. “Liberation of ancient Iraqi archaeological sites from the control of the forces of dark and evil is a victory not only for Iraqis but for all humanity,” Iraq’s Deputy Culture Minister Qais Hussein Rashid said after the army announced it had taken Nimrud. 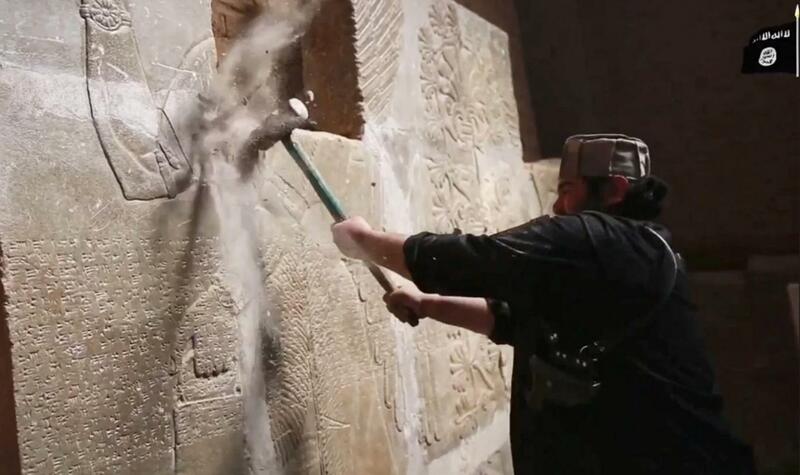 “It’s premature to talk about the extent of damage that has been caused by [Isis],” he added, although most experts are not optimistic about how much heritage is left to be saved.